Flavor Text: Leave no stone unturned. Danigral - 1 out of 5. Probably the worst character in the box. Not only is his ability conditional, but it gives your opponent the choice when you’re attacking, which makes him better on defense, but those aren’t the icons you really are desperate to gain on defense. mnBroncos - 3 out of 5. 3 cost is the sweet spot for characters in the game right now and not sure if this guy makes it. He is a very good defender because you will know when you commit him if will get the bonus but he is risky to send on offense. A good character but not sure how often he will make the cut. Obtuse - 2 out of 5. If my opponent is counter committing two characters I suspect bad things could be about to happen to me. At three cost I can think of a number of characters I would rather have. Kamacausey - 2 out of 5. The 3 drop slot has a lot of competition and I'm afraid that more often than not he just won't cut it. I like that he's an investigator and helps bolster that subtype but outside of an all investigator deck I don't know if he is good enough. livingend - 1 out of 5. Three cost characters have traditionally been the curve toppers for most decks. And while I do realize that this might change with the release of For the Greater Good, Detective Keen-Eye here is still just too vanilla for my taste to take up one of the prime slots in my curve. Verdict: Yeah… no. WWDrakey & Ire - 2 out of 5. Err... No. Just doesn't bring enough to the table, and allows your opponent to control what he can do. 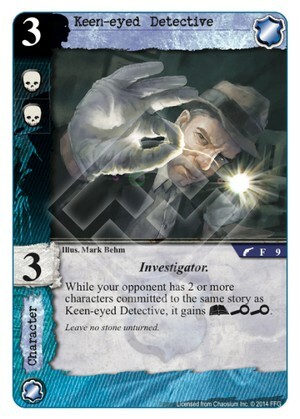 Has anyone found a good use for him in a investigator deck?